Tonight’s recipe comes from The Mushroom Lover’s Mushroom Cookbook. 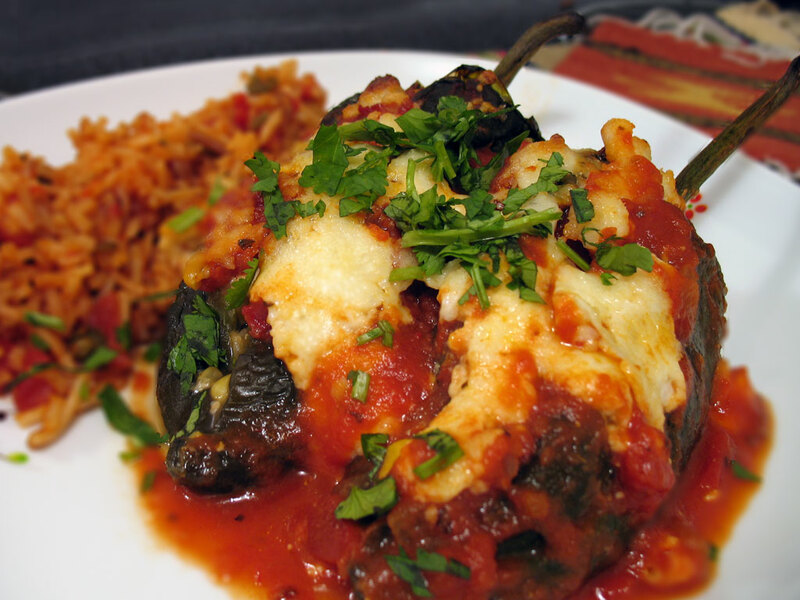 Roasted poblano peppers are stuffed with shrimp, portobello mushrooms, corn, onions, cheese, and cilantro. What to do for the guest who doesn’t enjoy mushrooms (or onions, or cilantro)? Just sub peas! Wow, this is a really good recipe. I like that these aren’t the battered and fried variety. The filling is *really* good. I shouldn’t have eaten all those chips earlier. I was totally full after just one of these — but it’s so good I keep eating it! It’s the peas that really make this dish! I’m digging through here and … hey, there’s some shrimp! Hey, there’s a little shroomy! It’s very good. Preheat the broiler, brush the peppers lightly with olive oil, and place them in a low-sided pan. Broil, turning the peppers as the skin blackens, for 12 minutes. Transfer the peppers to a bowl and cover with plastic wrap as they cool. When at room temperature, cut a slit lengthwise in each pepper, and scoop out the seeds and membranes. Turn the peppers over and remove the skin, which should scrape off easily. Cut the shrimp crosswise into thirds. Set aside. Heat the oil and the butter in a large skillet over medium heat. Add the onion and garlic and cook for about 4 minutes, or until the onion is softened. Stir in the mushrooms. Cover the skillet and cook until the mushrooms begin to give off liquid, about 2 minutes. Uncover the skillet, increase the heat to high, and cook, stirring, until the liquid is evaporated and the mushrooms are slightly browned, about 3 minutes. Add the shrimp and toss until they turn bright pink and firm, about 3 minutes. Transfer to a bowl and set aside. Stir the corn, half the queso fresco, the cilantro, and lime juice into the mushroom mixture. Divide the filling among the chilies, filling them completely. Close the chilies so the slits are barely visible. Pour half the tomato sauce over the bottom of an 8 inch square baking dish in which the chilies fit snugly. Pour the remaining sauce over. Sprinkle the remaining queso fresco over the chilies. Bake in a 350F oven until the sauce in the center of the dish is bubbling and the cheese is golden brown, about 45 minutes. Let stand 5 minutes before serving. This entry was posted on Sunday, November 4th, 2007 at 12:29 am	and is filed under Main Dishes, The Mushroom Lover's Cookbook. You can follow any responses to this entry through the RSS 2.0 feed. You can leave a response, or trackback from your own site. Thank you for stuffing this with ingredients other than cheese! Oh, this does look good! Thanks for sharing the recipe with me. My husband and I both love shrimp and portobellos. I’m going to try this out next time I’m in the mood for stuffed peppers.